Hi, after dieting for a few months now Ive very nearly reach my target weight, however, I need to start incorporating more protein my diet. 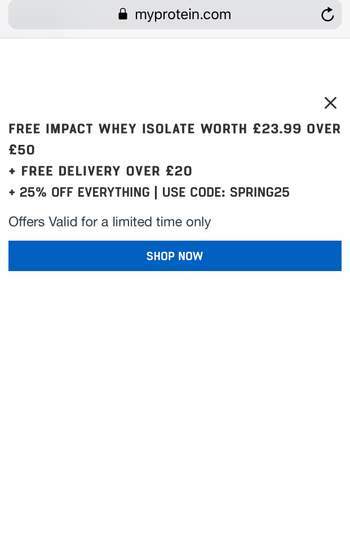 I was wondering where you all buy your protein powders and foods with added protein etc for a reasonable price as I'm not sure if the ones online like myprotein are rip offs or that's just the going rate? I eat nearly 200g protein a day. Trying to maintain muscle mass while cutting now, I have a protein shake in the morning from Myprotein 1.5 scoops is about 45g protein. 2 tins of tuna for lunch, 50g protein, a large tuna steak or salmon for dinner then another shake. Protein powders are not good but are convenient IMO, plant based protein is the best but it’s hard to consume enough of it to get lots of protein. I’ve also stopped eating meat everyday to look more after my health rather than my appearance. First off what do you want protein for? What are your goals can I ask? I eat nearly 200g protein a day. Trying to maintain muscle mass while …I eat nearly 200g protein a day. Trying to maintain muscle mass while cutting now, I have a protein shake in the morning from Myprotein 1.5 scoops is about 45g protein. 2 tins of tuna for lunch, 50g protein, a large tuna steak or salmon for dinner then another shake. Protein powders are not good but are convenient IMO, plant based protein is the best but it’s hard to consume enough of it to get lots of protein. I’ve also stopped eating meat everyday to look more after my health rather than my appearance. First off what do you want protein for? What are your goals can I ask? This doesn’t make it the worst protein, you can easily have amino acid supplements to replace what you aren’t gaining as a complete protein. Eating meat every day for protein has many long term effects on health and consuming whey everyday isn’t a good option for good nutrition. So it depends on the individual whether plant protein is the the worst, everyone has different circumstances and eating habits. What may be the worse for you may be the best for someone else. Currently an offer on Myprotein, 25% off and a free 1kg bag of protein if you spend £50 plus free delivery. You know your profile pic should be enough of a clue, but I've seen you moving from thread to thread for weeks now typing what can only be described as complete falsehoods. I'm not sure if it's intensional, or your just ignorant, but spreading such falsehoods is extremely dangerous especially when it comes to peoples health. Yesterday it was plastics, today it's protein. Do you make it up as you go along? Incomplete proteins? Do you have any idea how the human body actually works? Every day proteins are dumped from our bodies back into our digestive tracts. These proteins are then available to be broken down/recycled creating a resource pool of amino acids which can then be reassembled as required. You know your profile pic should be enough of a clue, but I've seen you …You know your profile pic should be enough of a clue, but I've seen you moving from thread to thread for weeks now typing what can only be described as complete falsehoods.I'm not sure if it's intensional, or your just ignorant, but spreading such falsehoods is extremely dangerous especially when it comes to peoples health.Yesterday it was plastics, today it's protein. Do you make it up as you go along?Incomplete proteins? Do you have any idea how the human body actually works? Every day proteins are dumped from our bodies back into our digestive tracts. These proteins are then available to be broken down/recycled creating a resource pool of amino acids which can then be reassembled as required. so where is the science supporting your nonsense claims princess? Science for what? That you can build muscle with plant protein? Or basic human biology? Science for what? That you can build muscle with plant protein? Or basic …Science for what? That you can build muscle with plant protein? Or basic human biology? I don't need to look anything up, your making assumptions and hoping they will bolster your argument. The reason I haven't advised the OP in relation to their original question is because I know nothing about their diet and lifestyle and it would be simply irresponsible for me to assume the facts of the situation. In relation to your argument, you are assuming that a person; whoever that may be is not eating a balanced diet in the first place and thereby will become deficient in a particular amino acid because they decide to put down the chicken and eat lentils, chickpeas, nuts or whatever. Anyone who cares about their health and physique should be taking the effort to ensure that their nutritional needs are covered, and this is true whether their protein comes from plants or animals. You can build perfectly good muscle ( indeed many would say better muscle) from plant based sources. Our bodies are continuously 'self cannibalising', recycling molecules to be used again, this isn't some wild assumption it's simply basic biology, indeed the majority of the amino acids we get each day will come from this recycling. It matters not what evidence I present to you, as you have an agenda, and I have no desire to waste my time arguing with you, my intension was to simply correct the falsehood you were alluding to regarding protein from plant sources. To put the biology simply, you don't need to eat a bone to make a bone, an eyeball to make an eyeball, or complete proteins to make new proteins.....the individual 'ingredients' of the structure can come from a variety of sources, including from within the body itself, or other food items you choose to eat. There is a film due to come out called the Game Changers which is set to bust the myth which says meat is necessary for protein. I urge you to open your mind and watch it, and you will find all the 'citation' you need. I don't need to look anything up, your making assumptions and hoping they …I don't need to look anything up, your making assumptions and hoping they will bolster your argument. The reason I haven't advised the OP in relation to their original question is because I know nothing about their diet and lifestyle and it would be simply irresponsible for me to assume the facts of the situation.In relation to your argument, you are assuming that a person; whoever that may be is not eating a balanced diet in the first place and thereby will become deficient in a particular amino acid because they decide to put down the chicken and eat lentils, chickpeas, nuts or whatever. Anyone who cares about their health and physique should be taking the effort to ensure that their nutritional needs are covered, and this is true whether their protein comes from plants or animals. You can build perfectly good muscle ( indeed many would say better muscle) from plant based sources.Our bodies are continuously 'self cannibalising', recycling molecules to be used again, this isn't some wild assumption it's simply basic biology, indeed the majority of the amino acids we get each day will come from this recycling.It matters not what evidence I present to you, as you have an agenda, and I have no desire to waste my time arguing with you, my intension was to simply correct the falsehood you were alluding to regarding protein from plant sources.To put the biology simply, you don't need to eat a bone to make a bone, an eyeball to make an eyeball, or complete proteins to make new proteins.....the individual 'ingredients' of the structure can come from a variety of sources, including from within the body itself, or other food items you choose to eat.There is a film due to come out called the Game Changers which is set to bust the myth which says meat is necessary for protein. I urge you to open your mind and watch it, and you will find all the 'citation' you need. the fact you refuse to look up a simple information proves your ignorance. Refusal to learn something new? What you said isn't new information to me or the scientific community. I know exactly what you are talking about which is why I felt qualified to address it. You suggest I'm one of "those vegans who tries to impose their lifestyle on others"is this because I corrected your misleading comments about consuming plant protein, or because of the documentary I asked you to watch? To suggest that a documentary is scaremongering nonsense because you don't agree with the lifestyle choices of the director is a laughable. The evidence is presented, how you interpret it is down to you entirely. I have no vegan agenda, I didn't come in here telling people to only eat plant proteins did I, I came in here to address your ignorant comments regarding nutrition and protein synthesis. I haven't told the OP where to get their protein from because I don't know anything about their diet, it's the OP's decision whether he chooses plant or animal protein, or a mixture of both. You seem to be under the illusion I'm some deranged vegan, this image perhaps helps sort things in your mind, but without wishing to completely shatter your image of me I studied at medical school before I was a vegan, I'm a highly qualified biologist and have studied in the field of biological sciences for nearly 30 years. I've spent years trawling medical and other scientific libraries around the world, this combined with studying statistics to degree level means I could present evidence here to support any argument, whether it be true or not. Unless you can interpret the evidence, anything I could present is worthless. The fact that you cant even grasp the basics indicates me that i would be simply wasting my time this afternoon gathering information from said libraries to present here, and surprisingly enough I don't have citation for everything I say immediately to hand and it would take time. You disagree with what I say, thats fine. I disagree with what you say and that's the point. An internet forum is entirely the wrong place to be seeking impartial health advice. I would thus advise anyone to thoroughly research anything they read on a forum themselves, when it comes to such matters.